← Ukraine’s Fractures. An interview with Volodymyr Ishchenko for New Left Review. In November 2013, members of the organization The City Is for All (A Város Mindenkié, henceforth AVM) were forcibly removed from the Budapest General Assembly, after forming a singing, poem-reciting human chain in protest of the extension of criminalization of homeless people ‘to a major part of the city’ (AVM 2013). This came less than a month after AVM addressed a letter to the United Nations Educational, Scientific and Cultural Organization (UNESCO) in an attempt to stop the use of heritage in this process of criminalization. Budapest, including the Banks of the Danube, the Buda Castle Quarter and Andrássy Avenue, possesses the status of ‘Outstanding Universal Value’ on UNESCO’s list of world heritage sites, and in October 2013, the Hungarian government declared the area of all heritage sites a homeless-free zone. As protest events continue to unfold on the streets of Ukraine and Bosnia, AVM’s fight against criminalization of homeless people in Hungary and the forms it takes asks us to think more broadly about struggles in and around ‘public’ and urban space, whether we have in mind the January 2013 ‘anti-protest laws’ passed in Ukraine that limited free speech and assembly in response to mass manifestations on the ‘Maidan’, or the tender and fraught alliance among homeless and occupiers in Occupy Wall Street’s home base, Zuccotti Park (Ehrenreich 2011, The Week 2011). The study of social movements requires more than attention to moments of protest. We must also take into account the way in which governance shapes the manner that struggle is enacted and conceived. The concept of ‘heritage’ is becoming an important player in the politics of urban space and related processes of dispossession, and its governance is shaping urban struggle. What are the stakes of labeling urban space heritage? What is at stake in how ‘public’ space will be conceptualized, and who will have access to its use? In the context of neo-liberal heritage governance, what strategies have emerged, and what are their limits? Keeping the question of public space in tension with the idea of the commons will allow us a critical vantage point into this space of struggle. Hungary’s ‘post-socialist’ path has conformed to the redistribution of wealth upward associated with neo-liberalization. In the ‘transition to capitalism’ the poverty rate has spiraled to new heights. Since 2009, the disparity of income between the top and bottom 10 percent of society has risen by 25 percent, and nearly 40 percent of Hungarians are estimated to be living under the subsistence minimum (Bence and Udvarhelyi 2013). Redistribution can be felt dramatically in the area of housing. The 55 percent of Budapest housing owned by the state in 1980 decreased to 13 percent by 1996, most poorly maintained and lacking in basic amenities (ibid.). Housing privatization in the 1990s deepened inequalities existent during state socialism (Bodnár 2001), while today, homeowners once encouraged to take mortgages in foreign currencies face growing housing debt due to the decreased value of the forint. Tens of thousands are threatened with eviction; the housing crisis will take the form of homelessness for many. In Budapest, nearly 4,000 people are forced to sleep in public space, while another 6,000 sleep in shelters and homeless hospitals (Bence and Udvarhelyi 2013). The country has also seen a ‘comprehensive authoritarian turn’ (AVM 2014). In the 2010 elections, the FIDESZ party (in coalition with the Christian Democratic People’s Party) won an absolute majority, allowing it to modify and revamp the 1989 constitution. The FIDESZ government’s unilateral drafting and passing of the new ‘Fundamental Law’ and subsequent amendments have led to a ‘new constitutional order’ (Scheppele 2011). To deplete the power of the Constitutional Court, once responsible for reviewing most laws for constitutionality, FIDESZ increased the number of judges on the bench and filled new positions with allies. The court’s jurisdiction was restricted so that it no longer reviews laws with impact on the budget, among them, those pertaining to taxes and austerity programs (ibid.). Among the many worrisome changes to the ‘constitution’ has been the explicit criminalization of homeless people. In November 2012, with FIDESZ-appointed judges still in the minority, the Constitutional Court ruled that “neither the removal of homeless people from public areas nor the incentive to avail themselves of the social care system shall be considered a legitimate constitutional reason that could be the basis of the criminalisation of homeless people’s living in public areas”(Misetics 2013). The court declared homelessness “a social problem which the state must handle within the framework of the social administration and social care instead of through punishment” (ibid.). The 4th Amendment to the Fundamental Law followed soon thereafter (March 2013), introducing legislation previously ruled unconstitutional, including the criminalization of homelessness (ibid.). Hungary’s recent history has been speckled with protests. Even FIDESZ’s unprecedented majority can be attributed in part to the party’s ability to harness legitimacy during protests against the ruling Socialist party (MSZP) occurring across several days and involving at least 40,000 protesters on repeated days in 2006. There have been countless labor strikes and activities, before and after FIDESZ’s 2011 introduction of a draft law that virtually illegalized strikes (Rindt 2012). Street protests, including one in 2011 attended by 100,000 people, have contested the reworking of the constitution, while student protests and an occupation at Eotvos Lorand University in 2012 have addressed education reforms. Waves of homeless protest in the ‘post-socialist’ era can be traced to 1989–1990, when, with wide citizen support, homeless people performed sit-ins in response to the closing of train stations where they sheltered (Udvarhelyi 2013, 137). Since 2009, AVM has conducted research, enacted campaigns, occupied buildings, and engaged in other forms of protest in pursuit of different politics around homelessness. It has organized widely to protest the anti-homeless content written into the Fundamental Law and other legislation emboldened by it. Emerging trends in the criminalization of the homeless and their ties to processes of neo-liberalization are well documented and theorized (Smith 1996; Mitchell 2003; Lippert and Walby 2013). As Roselyn Deutsche points out, such criminalization is served by a definition of the public (as in the term ‘public art’) in which homeless people have no part. Framed as an eyesore, dangerous, and a threat to the ‘quality of life’, homeless people are constructed as outside the real public. This tactic relies in part on the cultivation of a sentiment that excludes those who are homeless from our sense of community (Deutsche 1988; see also Budapest Sentinel 2013). I want to hone in here on the Hungarian government’s choice to refer to the territory on which life-reproducing acts by homeless people are punishable by making reference to its heritage status. Empowered by the 4th amendment, the amended Petty Offenses Act makes its anti-homeless content applicable to that urban space designated as heritage; nearly the entire downtown area of Budapest. Just what is done through heritage governance? An object of UNESCO policy since 1972, the term ‘heritage’ was used at first to designate the built or natural environment. More recently, cultural practices have been labeled as intangible heritage (ICH). UNESCO’s World Heritage Center promotes heritage protection as a path toward sustainable development, with the growth industry of tourism particularly in sight, and commitment to safeguard heritage can win a place on a World Heritage list. UNESCO regards tangible heritage as “our legacy from the past, what we live with today, and what we pass on to future generations.” Pointing to “places as unique and diverse as the wilds of East Africa’s Serengeti … and the Baroque cathedrals of Latin America,” it stresses that “what makes the concept of World Heritage exceptional is its universal application.” While UNESCO claims that sites “belong to all the peoples of the world, irrespective of the territory on which they are located,” (UNESCO 2014b) it follows from Hungary’s new laws that the large swath of Budapest designated as such does not belong to (homeless) Hungarians. The contradictions already apparent become deeper when we take into account the newer category of ICH. A “driving force of cultural diversity,” ICH “provides each bearer of such expressions a sense of identity and continuity, insofar as he or she takes ownership of them and constantly recreates them” (UNESCO 2014a). UNESCO claims that “while fragile, [ICH] is an important factor in maintaining cultural diversity in the face of growing globalization. An understanding of the [ICH] of different communities helps with intercultural dialogue, and encourages mutual respect for other ways of life” (ibid.). Here, UNESCO stresses that heritage governance preserves diversity, and locates the roots of disharmony and other social problems in globalization and intercultural strife. A key aspect of neo-liberal globalization is redistribution of wealth upward through processes of ‘accumulation by dispossession’ (Harvey 2003), often through privatization and enclosure of formerly public goods, including housing. Is this an aspect of globalization that UNESCO seeks to counter? Unfortunately, as Ellen Meiksins Wood points out, pluralisms reducing all difference to ‘identities’ have the effect of denying the systemic unity of, or very existence of, capitalism as a ‘social system’, reliant on class exploitation (1990, 76). Woods might ask UNESCO if it means to “celebrate class differences as it does diversities of life styles, culture, or sexual preference” (1990, 78). With all its attention to protecting marginalized groups, processes that produce an underclass or discriminate against it are invisible when looking through the lens of today’s heritage governance. Our case in Budapest points directly to contradictions in the governance of tangible and intangible heritage. ICH includes life-reproducing social practices, and its safeguarding it is meant to protect vulnerable groups under threat of globalization and discrimination. Budapest belongs to all mankind, yet here, expressly NOT to unhoused Hungarians. If “the importance of [ICH] is not the cultural manifestation itself but rather the wealth of knowledge and skills that is transmitted through it from one generation to the next,” and if “the social and economic value of this transmission of knowledge is relevant for minority groups and for mainstream social groups within a State,” (UNESCO 2014c) then what kinds of knowledge should be safeguarded? Which kinds of knowledge are under threat by neo-liberal globalization? To my knowledge, FIDESZ’s use of heritage site designation to determine the area upon which homeless people will be punished for life-reproducing acts is the first time UNESCO heritage has been used this way. It is not, however, the first time that a UNESCO heritage governance has played a hand that has been used explicitly in the politics of Budapest urban space. Hungary’s first UNESCO site, ‘the panorama of Budapest as seen from the Danube’, was inscripted in 1987 and expanded in 2002. In 2003, when plans to expand the motorway along the Buda bank of the Danube were greeted with widespread indignation, UNESCO experts visited Budapest in response to a letter in which the Budapest World Heritage Foundation expressed concerns with this project, and eventually warned the City Council that the title could be withdrawn if the project proceeded (Polyák 2006). UNESCO intervened again during debates around the ‘redevelopment’ of ‘Elizabethtown’ in central Pest, when demolition of historic buildings continued after its 2000 nomination for UNESCO heritage area status and 2005 inscription (ibid.). Contacted by an organization called Ovas!, UNESCO pressured the Ministry of Culture and Budapest’s mayor, resulting in the former changing its stance. AVM wrote to UNESCO regarding the anti-homeless laws in October 2013, appealing to UNESCO’s self-proclaimed goal “to further universal respect for justice, for the rule of law and for the human rights and fundamental freedoms” (AVM 2013). Pointing out that the government “used the UNESCO World Heritage protection to severely violate homeless people’s rights as well as the fundamental requirements of justice and rule of law,” AVM asked the director to “use all diplomatic means at your disposal to strengthen the international pressure on the Hungarian government to stop the criminalization and persecution of homeless people in Hungary and repeal this inhumane law” (AVM 2013). At the time of writing, AVM’s letter, which points right at the contradictions above, has yet to receive a response. Our case does not simply involve the built environment, tangible heritage; nor is it simply the use of heritage to ban people from mistreating heritage sites in need of protection. What we see is a process that continues the work of privatization of public space; of enclosing a commons practically, and conceptually. The normalization of this enclosure can be argued to rely on the cultivation of a certain kind of sensibility: it is an attack living cultural practices of Hungarians, and it underscores the contradictions of a heritage governance that has solidified during the neo-liberal era. As Barbara Kirschenblatt Gimblett argues, heritage is a value added industry (1998, 149), and heritage governance is also central in defining what qualifies as such. Vital and often non-capitalist social practices can be repackaged as heritage – among them, those that involve sharing common resources and the social relations that support their equitable use. In reference to struggles over ‘the commons’, George Caffentzis and Silvia Federici count UNESCO’s heritage arms among agencies of capitalist international establishment that work to co-opt practices (and language) of commoning that allow us to have “control over our lives and conditions of our reproduction, and to provide resources on the basis of sharing and equal access” (2013, 92). In this case, the value that heritage status gives to what appears as the built environment is revealed as a tool in the devaluation of ethics and practices that recognize the housing crisis for what it is, and the right to housing as a solution. Central to neo-liberal globalization are the transfer of resources upward and the facility with which wealth can move across national borders. While debates continue over how heritage designation affects property value, let’s not forget that Hungary is noted for its high levels of foreign direct investment since early in its post-socialist career, and that Budapest is touted as a prime spot for second home investment in Europe. In its complicity in the criminalization of homelessness produced in part through such processes, this heritage governance helps delegitimate collectivist values once normalized and supported by policies enacting the tenet of the right to housing during the socialist era. While state socialist housing policies were admittedly flawed (homelessness was criminalized even though the state failed to house everyone), they addressed and ameliorated a very real crisis. Today’s housing crisis results not from a scarcity of housing units, but from the commodification of housing, despite the United Nation’s recognition of the human right to housing in 1991 (General Comment #4 on Adequate Housing, United Nations Committee on Economic, Social and Cultural Rights). How is it that we have come to understand most of Budapest’s built environment as heritage to be protected, while overlooking cultural practices honoring the right to housing as heritage worth protecting? If naming cultural practices as heritage and their safeguarding is meant to protect marginalized groups, and to “reinforce a sense of identity and continuity with the past” (UNESCO 2014d), then cultural values and practices tied to the achievement of a relative equality vis-à-vis housing might be considered central. If so, then the results of attempts by socialist governments to equalize class and provide housing to all could be considered heritage to be protected (in contrast to what has been valorized as Communist tangible heritage in efforts to harness tourism). On this terrain of struggle, could the strategies of homeless people be a form of intangible heritage worth protecting? Caffenztis and Federici tell us that common/commoning is a dialectical noun-verb pair; the commons as they define it can only result from practices of commoning. Distinguishing the public from the commons, they point out that the former is managed for the people by the state, reminding us that one great challenge is finding “ways to connect the struggle over the public to those over the constitution of the commons” (93). But if we keep in mind that the public in common sense usage of the term ‘public space’ simultaneously implies the public as the people, and the space shared by or accessible to us all, we are already quite close to that commoning that produces ‘common’ space. When the homeless reproduce themselves in central Budapest, they take hold of those resources while reminding us of their dispossession, a dispossession that looms over all of us, and they remind us that our urban practices also shape what is perceived as public space. In such practices we might see the seeds of a wider commoning practice, in which a ‘public’ not divided into housed and homeless (always a shifting relationship) insists that this space is here for them, for us. Mary Taylor is Assistant Director of the Center for Place, Culture, and Politics at the Graduate Center of the City University of New York. 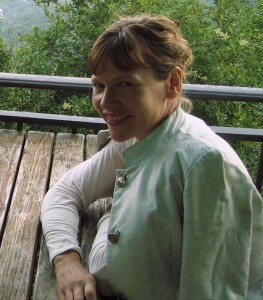 Her research focuses on sites, techniques and politics of civic cultivation, social movement, and cultural management; the relationship of ethics and aesthetics to nationalism and cultural differentiation, and people’s movements in interwar, socialist and post-socialist East-Central Europe and the Balkans. Currently, she is working on her book The Aesthetic Nation; Folk Dance, Populism and the Ethical Politics of Citizenship in Hungary. She has taught anthropology at Hunter College, the Cooper Union for the Advancement of Science and Art, and urban methods and theory in the Design and Urban Ecologies program at Parsons School of Design. A Város Mindenkié. 2013. “Open Letter to UNESCO by homeless people in Hungary.” AVM, 23 October, available at <http://avarosmindenkie.blog.hu/2013/10/24/open_letter_to_unesco_by_homeless_people_in_hungary>. A Város Mindenkié. 2014. “‘Being Homeless is Not a Crime!’ Call for Action: International Solidarity for Homeless People in Hungary,” available at <http://avarosmindenkie.blog.hu/2014/01/19/_being_homeless_is_not_a_crime_call_for_action_international_solidarity_with_homeless_people_in_hung>. Bence, Rita, and Eva Tessza Udvarhelyi. 2013. “The Growing Criminalization of Homelessness in Hungary: A Brief Overview.” European Journal of Homelessness 7(2): 133–43. Bodnár, Judit. 2001. Fin de Millénaire Budapest: Metamorphoses of Urban Life. Minneapolis: University of Minnesota Press. Budapest Sentinel. 2013. “City Council Bans Homeless in Budapest,” 14 October, available at <http://budapestsentinel.com/articles/city-council-bans-homeless-in-budapest/>. Caffentzis, George, and Silvia Federici. 2013. “Commoning Against and Beyond Capitalism.” Upping the Anti 15: 83–91. Deutsche, Rosalyn. 1998. Evictions: Art and Spatial Politics. Cambridge, MA: MIT Press. Ehrenreich, Barbara. 2011. “Why Homelessness Is Becoming an Occupy Wall Street Issue.” Mother Jones, 24 October, available at <www.motherjones.com/politics/2011/10/homelessness-occupy-wall-street>. Harvey, David. 2003. The New Imperialism. Oxford, UK: Oxford University Press. Kirschenblatt Gimblett, Barbara. 1998. “Destination Culture: Tourism, Museums, and Heritage.” Berkeley, CA: University of California Press. Lippert, Randy K., and Kevin Walby, eds. 2013. Policing Cities: Urban Securitization and Regulation in a Twenty-first Century World. London: Routledge. Meiksins Wood, Ellen. 1990. “The Uses and Abuses of ‘Civil Society’.” Socialist Register 26: 60–84. Misetics, Balint. 2013. “From Shelters to Prisons? How Homelessness became Illegal in Hungary.” Heinrich Böll Stiftung, 12 December, available at <www.boell.de/en/2013/12/12/shelters-prisons-how-homelessness-became-illegal-hungary>. Polyák, Levente. 2006. “Heritage as Argument, Heritage as Authority: Notions and Positions in Contemporary Budapest Urban Planning Discourse.” In The Politics of Heritage and Regional Development Strategies: Actors, Interests, Conflicts, ed. Sebastian Schröder-Esch and Justus H. Ulbricht. Weimar: Bauhaus Universität. Rindt, Zsuzsa. 2012. “Amended Strike Law One Year On.” EIRO online, 7 December, <www.eurofound.europa.eu/eiro/2012/02/articles/hu1202051i.htm>. Scheppele, Kim Lane. 2011. “Hungary’s Constitutional Revolution.” The New York Times, 19 December, available at <http://krugman.blogs.nytimes.com/2011/12/19/hungarys-constitutional-revolution/?_php=true&_type=blogs&_r=0>. Udvarhelyi, Tessza. 2013. “(In)justice on the Streets: The Long Housing Crisis in Hungary from Above and Below.” Ph.D. diss. City University of New York. United Nations Educational, Scientific and Cultural Organization. 2014a. “Intangible Heritage,” available at <http://portal.unesco.org/culture/en/ev.php-URL_ID=34325&URL_DO=DO_TOPIC&URL_SECTION=201.html>. United Nations Educational, Scientific and Cultural Organization. 2014b. “World Heritage,” available at <http://whc.unesco.org/en/about/>. United Nations Educational, Scientific and Cultural Organization. 2014c. “What is Intangible Heritage?” available at <www.unesco.org/culture/ich/index.php?pg=00002>. United Nations Educational, Scientific and Cultural Organization. 2014d. “Social Practice, Rituals and Festive Events,” available at <www.unesco.org/culture/ich/index.php?lg=en&pg=00055>. The Week. 2011. “Does Occupy Wall Street Have a Homeless Problem?” 2 November, available at <http://theweek.com/article/index/220968/does-occupy-wall-street-have-a-homeless-problem>.